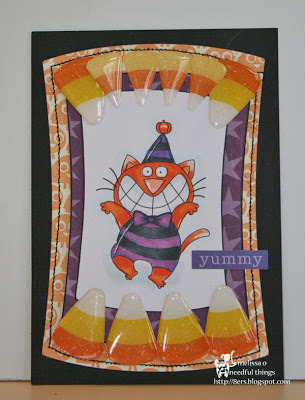 Melissa created a FUN card using Halloween Cat 01. The wonky rectangle die cuts made a opened mouth and those candy corns look like teeth. So clever! I heard this came from her son's idea. Please visit Melissa's blog and leave a comment for her and her lovely son!